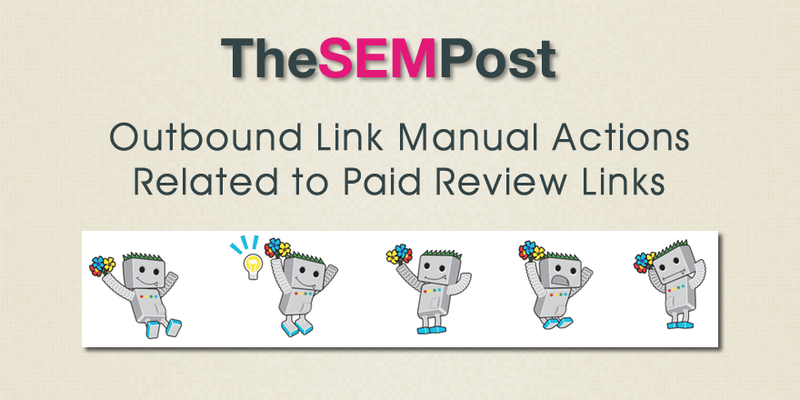 It seems that my speculation that the unnatural outbound link manual actions sent over the weekend were related to Google’s recent warning to bloggers about using followed links for paid reviews is accurate. Many, if not all, of the targeted sites are blogs and it is becoming apparent that they seem to have compensated reviews without using a nofollow in common. Now paid and compensated reviews can come in many forms, including where the product was free or discounted in exchange for a review or even a mere mention with a link. And the links don’t just refer to links to the company or product page, but can include links to social media accounts, retailers and affiliate links. And while linking to these external pages is fine, they must be nofollowed to meet Google’s webmaster guidelines. And it is also worth noting that these pages should have a disclaimer about the reviews as well. Google’s John Mueller responded to some of the active threads in the Webmaster Help forums about these manual actions, and both were about the issue of links in paid reviews. This one was a response in a thread where the webmaster shared their site that received a manual action, and again, compensated reviews was the culprit. In general, when you’re getting a free product (or service, etc) in exchange for a post, you need to make sure that the links there are nofollowed — be it to the original product page, a sales page or affiliate link on a site like Amazon, or to their social media profiles. You don’t need to nofollow everything on your blog, just the links that are involved in an exchange like this. Obviously, it’s also good to disclose this kind of relationship to your readers too — on the page I was looking at, you did that already, but others might not be doing that. Once you’ve cleaned up these kinds of outbound links by adding a nofollow where appropriate, feel free to submit a reconsideration request ( https://support.google.com/webmasters/answer/35843 ) so that it can be reviewed by our webspam folks & so that they can remove this manual action on your site. It looks like you’re getting some good advice here already (thanks, everyone!). Travler’s link – https://webmasters.googleblog.com/2016/03/best-practices-for-bloggers-reviewing.html – is one you should really be going through (in addition to the more general webmaster guidelines). There’s absolutely no need to nofollow every link on your site! However, those that are there because of an exchange (such as a product or service for a review) should have a rel=nofollow on links to the product, to their sales pages, and to any social media profiles that are linked because of the review. Also, it’s always a good idea to clearly label these kinds of posts for your readers too. Of course, there are other types of links, such as badges, link parties and link exchanges that could definitely fall under this manual action (and if those types of links are present, it could cause the reconsideration request to be denied), but it seems likely that the culprit is followed links to companies (including their social profiles and affiliate links) in exchange for products/reviews are the ones that triggered these manual actions in the first place. So nofollow these links to meet Google’s webmaster guidelines.